For years the true identity of world-renowned street artist Banksy has been in question. Many theories have been put forwards, no conclusive evidence has ever beenforthcoming. That is until now. A limited edition book is now available for pre-order which shows the artist, with paintbrush in hand, busy at work painting one of his most famous murals. 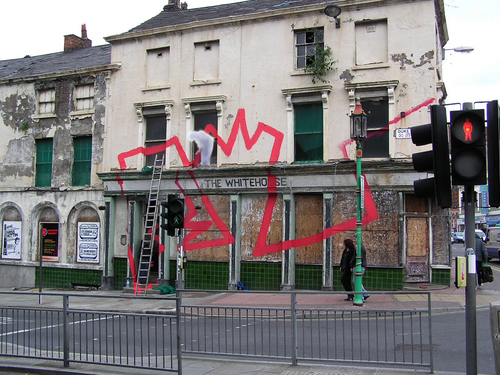 The book is a follow up to the 2014 project by Sincura Arts entitled STEALING BANKSY? which explored the social, legal and moral issues surrounding the sale of Street Art. It culminated in an exhibition and sale showcasing the most expensive collection of Banksy street art ever assembled under one roof. Or so we thought as this cloak and dagger exhibition was actually a stunt to secure interest in the world’s first street art museum. The new book, also called STEALING BANKSY?, reveals the untold story of the exhibition and the pieces that were showcased. It gives a first ever glimpse into the warehouses and processes used to restore these extraordinary artworks back to their former glory. It gives an insight into the future of the notorious workings. However, the thing that will grab the eye of the public and the headlines most, is that the book finally reveals 2 pictures of Banksy himself, with brush in hand, painting his now famous artwork. There has never before been conclusive photographic evidence of the illusive street artist painting one of his many pieces. 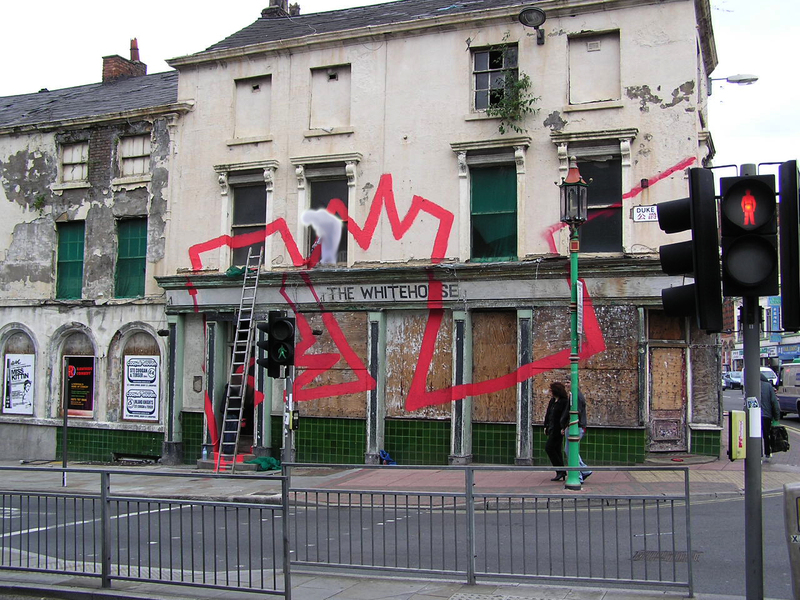 As explained by director Tony Baxter “we followed one piece, the Giant Rat on The Whitehouse Pub in Liverpool to catalogue the story. Whilst further researching the piece a local offered us photos taken from the night which literally knocked us off our feet. We toiled for 6 months over whether to include the damning photos and finally chose to do so under a number of caveats from the readers”. 1.That you will not reproduce or share any picture from the book including publishing them in the public domain. Each book has an encrypted pixel that allow us to trace each picture to each book. 2. That you will not use any picture in a legal or criminal proceeding against the artist. 3. Should any of the above 2 points be breached you agree to a financial donation of £250,000 to a registered charity. “Our goal was never to expose Banksy” says art curator Anthony Monaco, “but including these pictures complete the story. Otherwise it would be like telling the story of Napoleon but omitting the French Revolution”. A limited, numbered, run of books will be created ready for dispatch on December 1st. Books are priced at £15.99 plus delivery and can be pre-ordered at https://stealingbanksy.com/. Once the limited edition run has sold out the books will be available on general sale through selected outlets from February 2018. One of the pictures, with Banksy airbrushed, has been attached with this press release and can be used royalty free through Publications and separate media outlets. The original picture, as well as a close up of the artist, will feature in the book. This press release was distributed by ResponseSource Press Release Wire on behalf of The Sincura Group in the following categories: Men's Interest, Entertainment & Arts, Retail & Fashion, for more information visit https://pressreleasewire.responsesource.com/about.